In this first of its kind exhibition, we will present works created by Northwest artists who traveled to Alaska in the mid-20th century. In the summer of 1938, Tacoma photographer Virna Haffer (1899-1974) visited Alaska with her husband Norman Randall, a mining engineer, and produced a series of works while traveling in the Windham Bay region and other parts of the state. We will be featuring thirty of these vintage photographs, shown publicly for the first time. 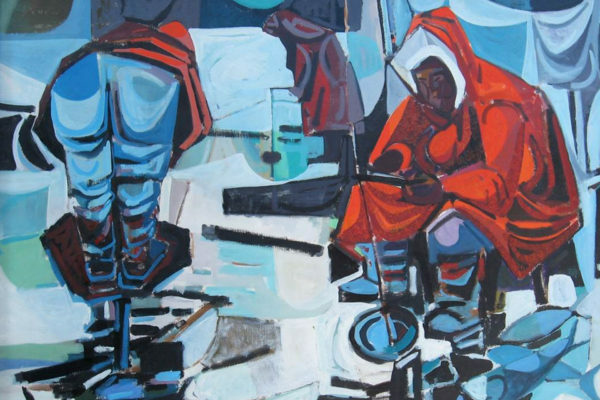 In 1959, Danny Pierce (1920-2014) and his budding family moved to Alaska where under a Carnegie Grant, he became the first artist-in-residence at the University of Alaska. The following year he founded the University’s art department, the first in the state. Danny made a significant contribution to painting and printmaking in Alaska, working with both Native and Caucasian artists and students. His bold modernist works introduced a new international aesthetic that had previously not been promoted in the region. Other artists featured in the exhibition include Steven Fuller (1911-1999) as well as Pierce’s students, the native Alaskan artists Bernard Katexac (1922-1997) and Joseph Senungetuk (b. 1940). This exhibition is sponsored by The Elizabeth Ruth Wallace Living Trust, in memory of Emil Stadler. Emil Stadler moved to Alaska in 1936 immediately following his graduation from Edmonds High School and lived there for 70 years. We are grateful to the Stadler family for their support of this exhibition.